Originally made for German TV in 2001, The Tunnel proved to be too exciting for mere broadcast. Now you can find The Tunnel on the U.S. art house circuit. The Tunnel is set in 1961. Berlin is still two cities, and because of massive emigration, the East is erecting the wall. An East German swimmer, Harry Melchior (Heino Ferch, Downfall), who had been tortured a decade earlier, is now ready to flee to the west with his sister Lotte (Alexandra Maria Lara, also from Downfall). 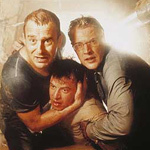 A small group of friends tries to escape via the sewers, and Harry manages to cross with a fake passport, but not everyone in their circle of friends makes it. Harry’s sister is still in the East, as is his friend’s wife. With no hope of getting passports for their families (escapees’ families are forbidden to leave the country), the men who made it to the West try a different tack. They undertake a huge engineering feat, tunneling more than 100 meters into East Germany from an empty warehouse in the West. The drama of life on the border keeps the tension high throughout the film. One of the protagonists, Fritzi (Nicolette Krebitz), tries to maintain a long-distance relationship with her boyfriend in the East, even though the physical distance is sometimes a matter of inches. Some easterners try to bust through the wall with heavy machinery, while others try to jump or climb where the wall is most insubstantial. Meanwhile, East German soldiers have orders to shoot anyone trying to escape. Some of the movie’s TV roots show through. The film is overscored, especially in the beginning. It’s probably trying to engage audiences who, at home, were in danger of changing the channel. In theaters, the score sounds heavyhanded. Also, the relentless cruelty of the East German regime is abbreviated into a single, sinister character, who is a little too villainous to be believable. But The Tunnel is basically a thriller and an action movie, so a little over-the-topness is called for. And once the movie hits its stride, none of these complaints are evident. Only the drama of people digging tirelessly to reunite with their families shows through.